25 April 2018 – Bahrain’s highest military court, the Military Court of Cassation, today rejected the final appeal of seven defendants – one soldier and six civilians. The decision comes exactly four months after the men were convicted on terror charges in an unfair military trial marred by allegations of torture, enforced disappearance, and other due process violations. Four of the appellants – civilians Fadhel Al Sayed Abbas Hassan Radhi, Sayed Alawi Husain Alawi Husain, and Mohamed Abdulhasan Ahmed Kadhem al-Mutaghawi; and the one soldier, Mubarak Adel Mubarak Mahanna – are now at imminent risk of execution, while the remaining three – civilians Mohamed Abdulhusain Saleh al-Shehabi, Mohamed Abdulwahid Mohamed al-Najjar, and Husain Mohamed Ahmed Shehab – are forced to serve their prison terms. They have exhausted all domestic legal remedies. 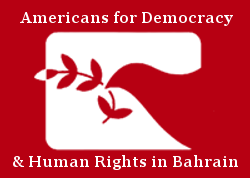 Americans for Democracy & Human Rights in Bahrain (ADHRB), the Bahrain Institute for Rights and Democracy (BIRD) and the European Centre for Democracy and Human Rights (ECDHR) unequivocally condemn the use of military courts to try civilians and are gravely alarmed by confirmation of these harsh sentences despite credible evidence of abuse. The seven appellants in today’s hearing were part of Bahrain’s first military trial for civilians since the government amended the constitution in April 2017 to remove a ban on the practice, and the first since the emergency security tribunals of 2011, known as the National Safety Courts. On 25 December 2017, the Bahraini Military High Court convicted 13 men on charges of forming a terrorist cell and plotting to assassinate a military official. The court sentenced six men – civilians Fadhel Al Sayed Abbas Hassan Radhi, Sayed Alawi Husain Alawi Husain, Mohamed Abdulhasan Ahmed Kadhem al-Mutaghawi, Murtada Majeed Ramadan Alawi, and Habeeb Abdullah Hassan Ali; and the soldier, Mubarak Adel Mubarak Mahanna – to death and 15 years in prison. It sentenced another seven civilians to seven years’ imprisonment and revoked Bahraini citizenship of all 13 convicted. Though an initial appeal in February 2018 reduced the prison terms of two defendants – Husain Mohamed Ahmed Shehab and Mohamed Yusuf Marhoon Al Ajmi – from seven to five years, all other sentences have been confirmed. Two of the six men sentenced to death were tried in absentia and remain outside the country; the four who appealed today are now facing imminent execution. Sources tell ADHRB that family members of those sentenced to death have been summoned to appear before the military court tomorrow morning for unknown reasons, raising concern that the king has already ratified the decision and that the executions will be carried out immediately. Both the initial and appeal proceedings have been rife with due process and human rights violations. Several defendants report that officials tortured them to extract confessions, and some – like Sayed Alawi, Sayed Fadhel, and Mohamed al-Mutaghawi – were subjected to enforced disappearance and incommunicado detention. Eight defendants were convicted in absentia, and the court “issued a decision banning the publication of any information, data or news by any audio-visual, electronic or written media.” In the original trial, the authorities prevented some defendants from meeting with a lawyer until the third hearing in November 2017, and the court rejected defense counsel requests to re-examine suspects, question anonymous witnesses, and allow the defendants to speak during the initial appeal. Some of the defendants are members of Bahraini religious and activist networks, raising further concerns about reprisal: Sayed Alawi was a personal aide to Sheikh Isa Qassim, Bahrain’s preeminent Shia Muslim religious leader who has faced arbitrary judicial harassment since June 2016; and Mohamed al-Mutaghawi is reported to have worked to document abuses with the Bahrain Independent Commission of Inquiry (BICI) in 2011. The defendants in custody are now being held in military facilities of the Bahrain Defence Force (BDF), though the military continues to refuse to acknowledge their exact whereabouts to family members. Bahrain’s use of the BDF military courts to try civilians violates international fair trial standards, and the excessive ambiguity of the April 2017 constitutional amendment leaves further room for abuse. The new amendment includes no language limiting the duration of military jurisdiction; providing for civilian oversight or review; restricting the military court’s jurisdiction to particular crimes; or elaborating on any appellate measures or other rights of due process and fair trials. Civilians tried before military courts are afforded only the rights granted to military personnel under the Military Judiciary Law. As such, after amending the constitution, the Bahraini government also amended the Military Judiciary Law to delineate the specific circumstances under which civilians could be tried before the military courts. This amendment empowers the Office of Public Prosecution to refer political cases to the military and includes charges designed to silence criticism of the government, allowing them to be adjudicated by a military court without the same guarantees for due process provided in the Bahraini constitution. Among the offenses subject to military review are: inciting hostility against the government, operating an organization without a license, and possessing pictures that will “cause offence to the country’s reputation.” The criminalization of such nonviolent acts is already in clear violation of the rights to freedoms of expression and assembly, and the recent amendment to the Military Judiciary Law brings these cases under the jurisdiction of the military courts, further undermining due process rights in politically motivated trials. The amendments to Bahrain’s constitution and Military Judiciary Law contravene the kingdom’s international obligations and disregard its reform commitments under the BICI. The government’s actions also explicitly violate recommendations that Bahrain accepted as part of its United Nations (UN) Universal Periodic Review (UPR) process, which called on the authorities to ensure that civilians are never again tried in military courts. Despite the Bahraini military’s explicit role in these violations of international law, the United States (US) has deepened its security ties with the BDF under the Trump administration. Eight-five percent of the BDF’s armaments are already estimated to be American-made, and in March 2017, just as Bahrain’s parliament was pushing through the constitutional amendment, the Trump Administration signaled it would drop all remaining restrictions on a multi-billion-dollar arms sale to the kingdom. It not only authorized but expanded the sale later that year, and in November 2017 Bahrain’s Crown Prince Salman bin Hamad Al Khalifa met with President Donald Trump and other administration officials to focus on further deepening US-Bahrain defense cooperation. Since 2015, the US government has justified resuming arms transfers to the Bahraini military because the BDF had been removed from domestic repression. However, the BDF has now directly resumed this role, and there is evidence that these civilian prisoners are being detained and even tortured by BDF personnel, in BDF facilities. This compounds the Bahraini military’s longstanding problems of sectarian discrimination and extremism, documented by ADHRB, as well as its increased control over the public healthcare system. ADHRB, BIRD and ECDHR condemn in the strongest possible terms Bahrain’s use of military courts to try civilians and its continued use of the death penalty. We call on the Bahraini government to repeal the constitutional amendment allowing these proceedings, nullify the rulings, institute a new moratorium on capital punishment, and ensure that any future trial is conducted in a civilian court adhering to international standards. Moreover, we call for an independent investigation into credible reports of the defendants being subjected to torture and enforced disappearance, both by police and military officials. Lastly, we urge the international community, and particularly the United States and the United Kingdom, to take immediate action to prevent the execution of these prisoners by suspending all defense cooperation with Bahrain until such time as it is no longer subjecting civilians to politically motivated trials in military courts.